There are several things to consider when measuring your supports. EXTENDED LENGTH: This is the fully extended length of your support measured from the center of the Ball Socket, Eyelet or Rivet (if a bracket is used). Refer to the picture below marked with the letter "A"
RETRACTED LENGTH: This is the fully collapsed length of the support measured from the center of the Ball Socket, Eyelet or Rivet (if a bracket is used) In some cases it is impossible to do this without removing the support so what we suggest is to measure the body (not shaft) of the unit from the one end that the support has the Ball Socket, Eyelet or Rivet (if a bracket is used) to the area where the shaft begins and add 3/4". Refer to picture B-1 if you can collapse your support, or B-2 if you can not compress the support. 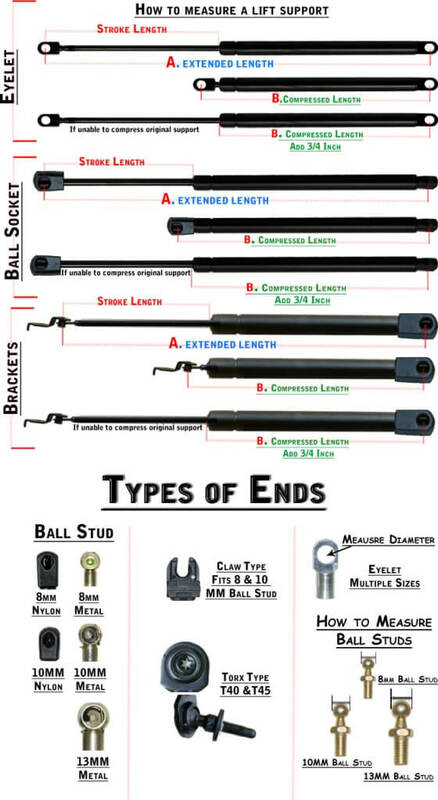 ENDING TYPES: There are quite a few different types of ends used on lift supports, below we have listed a few of the most popular. The most common size is a 10mm ball stud, however there are 8, 13 and some 16mm ball studs used as well. Eyelets come in a wide variety of ranges as well and need to be measured across the end. For uses that require a more secure end the metal types are the best, and for any heavy weight lifting over 150lbs 13mm types are strongly suggested. STROKE: This is the actual travel distance that the piston can travel. This is determined by measuring the actual shaft length on your existing unit. This measurement is often overlooked and if it is too short will not allow the device you are using it on to close properly. In cases where you are not 100% sure, and if you have an old unit, you can place tightly place a rubber band on the shaft, close the device and measure the distance to where the rubber band had moved to. In the event that you do not have a metric measuring device below are a few of the most popular conversions. 8mm =5/16" =.32" 10mm = 3/8" = .39" 13mm = 1/2" = .50"
We are capable of building many different configurations and if you can't find what you need on our size selection chart send us the details and we will gladly quote you on your needs. Greetings: For your special project please keep in mind that we do not have a design staff, nor any qualified engineers or software to tell you what is right for your application. We have worked with individuals and have had great success however it may take a little bit of trial and error but our goal is to work with you and help you with your needs. Feel free to send us a description of your needs and we'll do our best to take care of you.